What a busy Friday night we had! First, of course, we heard that Dollhouse has been renewed, though the formal announcement won’t be until Monday. Joss Whedon has commented on the renewal, and it’s true! This was a really big long-shot here, and I’m very surprised that they said yes, but I’m happy! Not only that, but Castle was renewed. Plus, Amy Acker’s new pilot Happy Town has been picked up. It’s been a very nice weekend for the Whedonverse. The only downside to me is that Scrubs was also renewed. I really wanted this show to rest in peace after its fantastic finale. Others aren’t quite as disappointed as I am–at least it’s a funny show–but I just think such a great finale as only a season finale (especially since Sarah Chalke and Zach Braff will be around for six episodes) is just a waste, and I’m afraid that the following season will just bring it down from such a high note. Anyway…at least people aren’t out of jobs. So what about my poll? I figure I should post my results now, seeing as some of our “bubble shows” have just been renewed. Keep in mind, these aren’t very representative or true to life. Forcing people to choose only one show when so many people are worried about bubble shows makes one tend to vote for their favorite shows on the bubble. Plus, with grabbing only my readers, my readers on Twitter, and my personal friends on Facebook, you don’t get exactly a perfect sampling of the populate. But it was still fun. 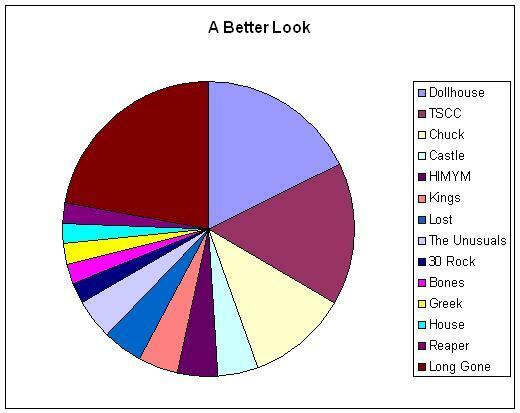 As you can see, Dollhouse and Terminator: The Sarah Connor Chronicles were the top two, followed by Chuck. I think that’s not a huge surprise–especially since so many people I’m connected to are in the Whedonverse. What surprised me is that next up are some shows that have been long gone. I mean, multiple votes for All in the Family? Seriously? 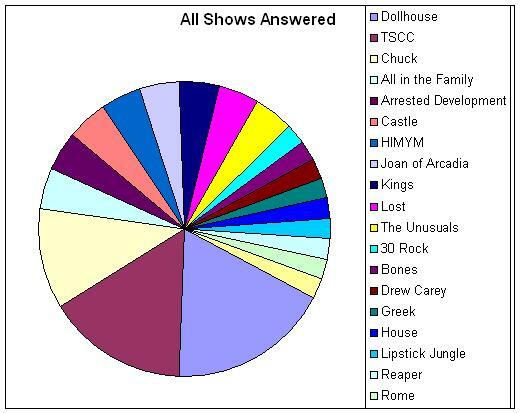 But it’s good to know that Castle and How I Met Your Mother are up there, too (again, shows from the ‘verse). So, now you see that our Whedonverse shows really are on top. And then come some good favorites. Honestly, I’m surprised that Lost didn’t get more votes, but like I said, I think people were more worried about the bubble shows. I did get a lot of people saying that they chose one show to save but would choose How I Met Your Mother overall. That’s nice. It’s good to see The Unusuals on there, too, but I’m disappointed that more people didn’t say Kings. Kings on Twitter are really trying as hard as they can to spread the word about renewal. I wish it was a little stronger! 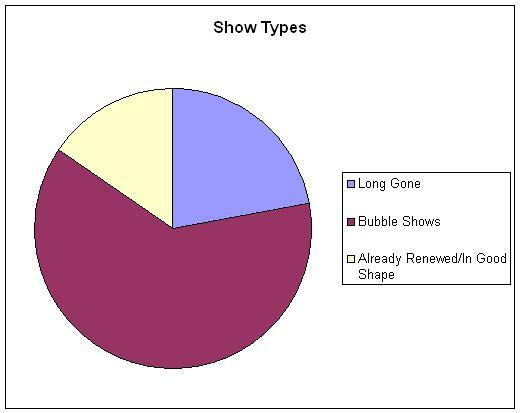 Finally, just to prove I’m not crazy, here’s how it breaks down with shows that were on the bubble at the time of the poll, shows that were safe or already renewed, and the long gone. All that purple means that people really care about their bubble shows. But then again, there were a lot this year. I mean, even Bones was on the bubble (has that been renewed yet?Update: Just got renewed!). Anyway, the poll was fun. Let me know if there are any other poll suggestions you have. Next year, this should be even more fun. Who knows what shows will be on the air then? And maybe more people will be on Twitter or reading this blog so I can get a better sampling! UPDATE: Just heard via Twitter that The Unusuals was not renewed. I’m heartbroken. 😦 Why, ABC, why?